When Longboat Key, FL, natives Vic Falck and Geordie Rauch went to California in the summer of 2010 their main focus was on completing their service in the Navy following their recent enlistment. When they returned to Florida five years later they did so with a newfound friend who had a talent for brewing beer and the dream of starting their own craft brewery. Falck and Rauch said they have always had a strong passion for beer but they credit a well-timed California craft beer explosion for getting them interested in the business of craft brewing. They began experimenting with some home brews soon after the craft beer wave took place, but after dozens of mediocre malt extract boils, as Falck described them, they realized that neither of them possessed the patience or know-how to create truly exceptional beers. Fortunately for Falck and Rauch, they were acquainted with Jason Thompson, an avid home brewer from California with a reputation for producing some popular recipes. When they presented Thompson with the idea of brewing his recipes on a full-scale system as a head brewer, he jumped all over it. The trio returned to Sarasota, FL in 2015 and purchased an empty 8,500-square-foot warehouse with the intent of making it their new beer making home. It took approximately a year and a half to build out the interior, but when their business officially opened during the summer of 2016 it had been transformed into a state of the art facility. Today the brewery includes a production facility stocked with a grain mill, a 15-barrel brew house, an oak fermentation foeder and six stainless steel fermenters. The building also has a unique taproom that features a rotating selection of tasty brews. The taproom is complemented with weekly live music, rotating food truck visits and various games. In coming up with a name for the brewery the three friends were looking for something that was relevant to the area and that would be representative of who they were. Falck and Rauch grew up regularly partaking in water activities along the southwest coast of Florida, and after doing some historical research they learned that up until the 1700s this same coast had been inhabited by a group of Native Americans called the Calusa. 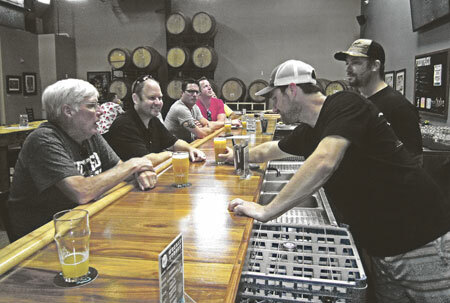 Following in the Calusas’ footsteps means bringing something new to the table as the trio joined five other well-established breweries in the Sarasota area. Falck said they are able to stand out from the rest by bringing their own unique blend to the region based on what they learned in California. As the head brewer, Thompson’s expertise plays a large part in what is put out to the public. He said Calusa differs from other breweries because it focuses on hoppy, West Coast beers, as well as barrel-aged beers and sours. Falck pointed out that they also use something called the solera method, or fractional blending, to make many of their barrel-aged beers and sours. This method involves removing a small amount of aged brew from certain barrels and replacing it with slightly younger brew of the same recipe. After a period of time the younger brew gradually takes on the character of the older brew. The main advantage of this method is that it provides a constant supply of sour beer that takes less time to age because of the blended components. Rauch said the new foeder they purchased in September 2017 plays a key role in the solera method. To help prevent contamination from occurring Rauch pointed out that they make sure to use separate hoses, parts and equipment from other tanks when working around the foeder. They also don’t work with the same beers on the same day so that there is less risk of contamination. Falck said at any one time they have anywhere from 50 to 60 wooden barrels at their brewery aging product that comes from this solera method. Most of these barrels are found within the taproom itself, serving as an interesting design while they age the beer. Rauch said the distribution of their beer has remained relatively local and mainly includes classic beers that people are familiar with. Providing craft beer drinkers with the classics helps to slowly introduce them to styles they have never had before. According to Falck, the main reason they are staying relatively local for now is due to the current high demand from their customers. He noted that they are taking steps to boost their production in order to meet current as well as future demands. For more information about Calusa Brewing visit www.calusabrewing.com.